August Break: What the wash? – Sunshine. Whimsy. Tacos. Apartments here don’t come with clothing washers built in. When I moved in, I had to buy one. 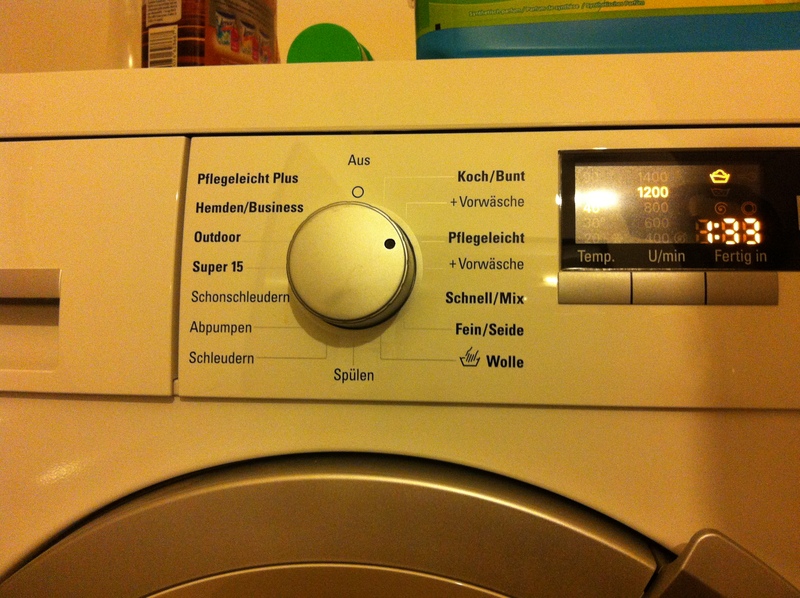 To this day, I still don’t quite know what all the functions do, because the instruction manual is also auf Deutsch. Do you prefer front-loaders or top-loaders? It looks like it has a setting for giving your laundry the Business. I’m surprised there’s no eco setting. If we have time, we usually use the eco setting, but mostly I use the speed 30 min setting. Koch is the normal setting and should have more time options than the others. I’d guess business is for suits, and outdoor would be for muddy things? I think most of the settings are “eco,” because a normal load takes about two, two and a half hours but Schnell works in about one hour. The ‘outdoor’ is actually for outerwear like jackets with special water resistant coatings (Jack Wolfskin, Mammut, etc), but I need to read up on how to use that without ruining the coating. I always gave my suit to the laundry – is that something you can wash at home (more than once)? Depends on the suit. Washable suits do exist. Most should be dry cleaned though.